Feel free to donate to help support ProgrammingKnowledge. All contributions will be used to upgrade the website, buy new software, and enhance the quality of our tutorials. Thank you so much to all of those who have contributed! I make video tutorials and post it on YouTube and my Blog. 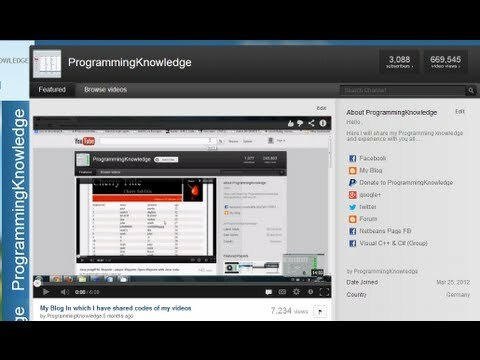 These tutorials are about Programming and I did enjoy making them. Answering people's questions is great, and the feeling you get when you solve a problem always felt good. The only problem I have is: making tutorials is a little bit time consuming.Regardless I did enjoy it all. please also make NETWORKING tutorials brother!! Sir i learn 70% of my swing programming from your video. I think you produce more software programmer than any Training institute. With in 3 Month i make 2 professional project with the help of your video. Fantastic! Can you also make some videos on using Drawing API's? I lear lot and I got lot of help when im implementing my projects thank you and keep on. Thanks a lot. Your videos are very helpful. I really enjoyed the video that i subscribed from u sir, i say more grease to your elbow, Thanks alot. You've done a great job :) Keep it up! YOUR GREAT SIR !! THANK YOU !! : KEEP UP THE GOOD WORK !! OH MY GOSH THAT'S A LOT OF KNOWLEDGE TO OBTAIN!!! and I LOVE IT!!! Talk about jumping for joy, thank you so much for the massive amount of videos to learn from, please keep at it sir. I'm going to go share this with some friends.